Should I use a Marshrutka or a bus? What is the difference? The word bus is translated into Russian as Avtobus and they work in very much the same manner as buses in Europe and the United States. You purchase your ticket either beforehand or as you enter the vehicle. The route of the Avtobus is pre determined and it will collect additional passengers at various bus stops along it’s route. Buses generally do not deviate from the route (just like buses in Europe/U.S.A). The word Marshrutka is a colloquial term that comes from the name Marshrutniya Taxi, translated into English it means routed taxi. The Marshrutka is typically a minibus or transit type vehicle that will carry up to 12 people, mostly seated with some spare room for those who are brave enough to stand. The vehicle will have a starting point and an end point but will stop anywhere to drop off or collect passengers. Lets say it is pouring with rain, a typical bus will drop you off at one of the many bus stops which could be some way from your home. 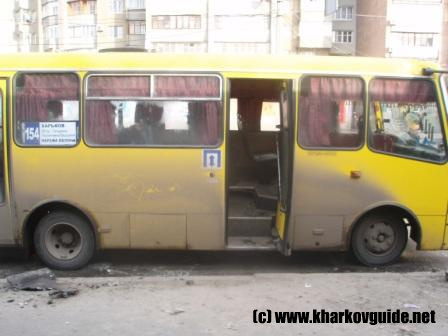 However, on a Marshrutka you can request that you be dropped off anywhere on the route. 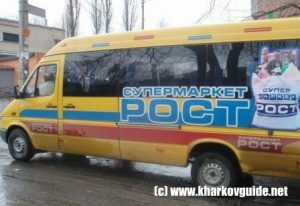 It is best to think of a Marshrutka as a shared taxi/minibus that may also deviate slightly from it’s route. Unlike an Avtobus there is no set timetable, the vehicle will leave it’s starting point when there are enough people inside. You generally do not have to wait for along time when you are inside a Marshrutka, they are very popular and fill up quickly. This form of transport is so popular, not just in Ukraine but in all former Soviet states, as they are only slightly more expensive than public transport but are so much quicker and convenient. Waiting for public transport such as a bus or train can be a real annoyance, especially when the service is cancelled and the temperature is -20 degrees outside! The cost of the journey will vary depending on it’s length and the owner of the vehicle. They are more expensive than a bus or train but cheaper than a taxi. The cost of the journey is written on a card and usually diplayed on the dashboard. The vehicles are privately owned but usually have a licence from the city authorities. It not unusual for a small business to operate several vehicles in one city. The driver will accept cash only. You will get a very strnage look if you try to pay by card!